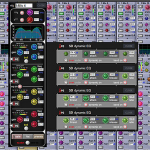 Here we go with a couple more of my non-negotiables for achieving great audio. The loudspeaker system is a part of the chain that everything is dependent on. Everything we’re mixing or reinforcing is presented through it so it influences every decision we make. If the loudspeaker system isn’t right, nothing will be right. As a mixer, I find myself fighting things a lot more when the system isn’t right. Things don’t respond the way I’m used to, and normal techniques don’t get the same results. As a result it takes a lot more work and time to get an acceptable mix, but even that result is often compromised from its true potential. One of the less talked about aspects of this is it can also be incredibly discouraging to work on a system that not properly optimized. This is part of why I am such a huge advocate for getting the system right and why I am trying to help churches with this whenever I can right now. If you’re using volunteers or less-experienced engineers for your services, not only are you handicapping their potential to achieve a great mix, but you’re also limiting their ability to improve their craft. I believe it is a fact that mixes sound better on systems that are properly optimized, and engineers improve faster on systems that are properly optimized. You should do whatever you can to make sure your system is right. If you’d like me to come and evaluate your current situation and give you a tune-up, please contact me and we can put a date on the calendar. I’m not scheduling things for early 2016. The mix position needs to be in a location where the mix engineer can hear an accurate representation of what the PA is delivering to the audience. If you get the PA coverage and optimization right but the mixer is outside of all that, nothing is going to matter. A mix position where the engineer can’t hear an accurate representation is like asking someone to drive with their windshield covered in mud. They might be able to figure out a way to make it work, but would you really want to get into that car with him? I’ve seen mix positions getting a lot better, but there is still work to be done. 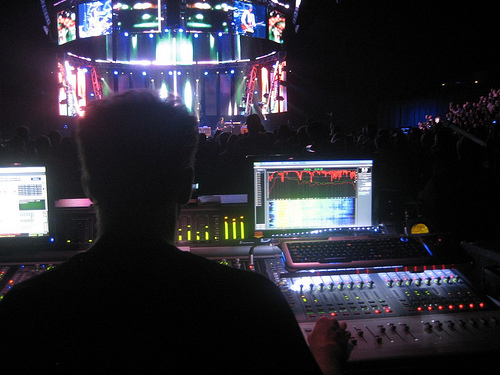 With the advent of digital consoles and a potentially shrinking FOH equipment inventory, it is easier than ever to locate the mix position optimally in a way that minimizes distraction. And, honestly, I don’t think it’s as big of a distraction as some people think. We are SO used to technology being around these days that a lot of this stuff disappears to audience members. For me, the ideal mix position should be on-axis of the main loudspeaker system in a position where the frequency coverage is the most even. In other words, the mix position needs to hear all the frequencies. I see a lot of places with mix position set up off-center with spaced sub-woofers that create nulls across the listening area with typically the first one right where the console is located. The result is the mix engineer can’t hear all the frequencies in the low end and will potentially overcook the sub-lows much to the chagrin of some listeners. Also, being off-center can create more challenges if the loudspeaker system is “stereo”. This is another reason I always want to be centered between the speakers so long as I remain on-axis to them. It’s too easy for an engineer to create an unbalanced mix when what they hear is unbalanced due to closer proximity to one of the speaker stacks, and I’ve definitely fallen into this trap before. The tendency when off-center is to overcook the side the mix position is farthest from. 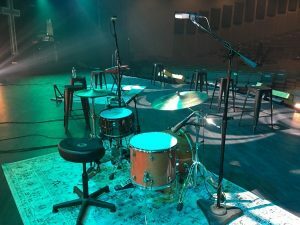 If you’ve been reading my articles for a while you’ll probably already know I’m not a big fan of doing a lot of panning in live sound, however, a little bit can still be helpful. Being off-center, though, can make this a lot harder to pull off. I also prefer that mix position is on the same level with the audience. A lot of tech booths and FOH positions are slightly elevated these days at the back of the room, but I’m not typically a fan of this especially if the platform is hollow underneath since it can resonate in strange ways. 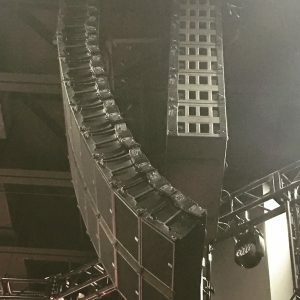 Plus, it may only take a foot or two of elevation to move the mix position above the high frequency coverage of the loudspeaker system. 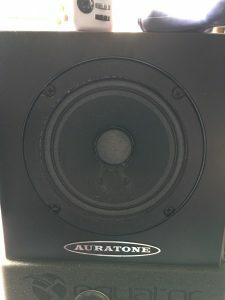 Being at the back of the room up against a wall can also place the mix position in a bass trap if it’s too close to the wall or in a null if it is just in front of the buildup. Ideally, mix position should be far enough away from reflective surfaces so they can’t cause problems. The “dugout” FOH setups I see can also be problematic if the walls in it are not properly treated. I’m not sure if anyone else refers to these setups this way, but that’s the best way I can describe them. These are popular with stadium seating and bleacher setups where the seats go up along the sides of FOH. I was recently at the Cirque Du Soleil installation in Orlando, FL where every surface of the walls in their dugout FOH were treated in absorption, and that’s exactly what I would do. Now, taking all of this stuff into account, if I was setting up to mix in my ideal position, it would probably be centered on the floor about 2/3 back into the audience, but not more than 75-100′ from the PA. If you get too far, the delay in arrival of the sound can play with the ability to actually mix. I’ve been further out and a lot of touring guys end up further out, but the further you get the more of a challenge. Now, I realize that mix position is often one of the things in an install and even touring situations that needs to be compromised. There is no perfect in what we do in audio so it’s natural to compromise things. Just remember, though, that compromising the mix position can be a large compromise on the final product. 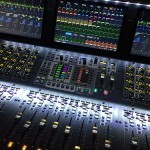 What the mix engineer is hearing plays an enormous role in how that engineer will mix. So I believe every step should be taken to get this as optimal as possible. Mix positions should stay away from loudspeaker/environment seams. 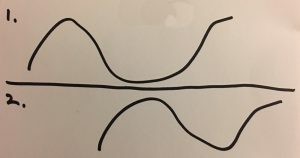 If a center channel does not exist, a mix position in the center of the room can be very problematic. Typically, mix positions 2/3 back and 1/3 off the right of left give a very accurate feel for the overall mix. I disagree. While I have heard some funkiness on a couple occasions from being in the center, there’s s reason why the big chair FOH engineers set up there.